Gorgeous color, grows well and is thriving where it is planted. Not quite lush, but very far indeed from sparse. I cant believe the height on this plant! It is huge in a short amount of time. Ostrich Fern is often seen in Eastern and Northern Europe, Northern Asia and Northern North America. This fern commonly grows in Wet areas near streams and ponds and shady wooded areas. They work great as providing a beautiful ground cover. They also look amazing when added to flower gardens that offer beautiful perennials. They also work very well when used to create cute and colorful borders for fences, sidewalks, and too long driveways. These even do great when planted around a retaining wall on the property and also in rock gardens. They bring lots of colors also when added to water garden locations. These ferns are shipped from this fantastic online plant nursery and are ready to plant and add an exclusive look and feel to all gardens and natural areas. They also include all planting and all instructions needed to grow healthy and beautiful ferns. The Ostrich Fern, appropriately named for its graceful, ostrich feather-like leaves and erect stature, are easily grown in fertile, moist soils. Although this widely-known fern is non-flowering, it spreads fast and forms dense foliage when the growing conditions are optimum. Ostrich Ferns do well around damp areas and bodies of water. They are intolerant of heat, especially the hot southern summers. Shady woodland regions are best for garden planting. Most gardeners plant them in groups along with early spring wildflowers. Although the plants do well in colder climates, they usually go dormant upon the arrival of winter. When the Ostrich Ferns reach maturity, they have a bright light-green color. Like most ferns, these do great in containers and are low-maintenance. 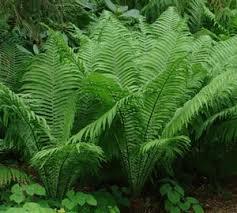 Spiraling up to 3 to 8 feet high and 2 feet across, the ferns provide excellent ground cover without becoming invasive. Ostrich Ferns are high to be planted to help prevent soil erosion as the roots grow underground to help make soils strong.